With HTTP/2 Server Push, step 3 is essentially eliminated. 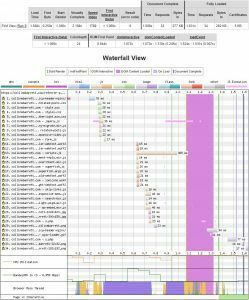 When a server receives a request for a document, it can now anticipate which additional resources the browser would request to complete the rendering of the page and send those before the browser even requests them. This sounds like a performance boost in theory; but, in my quick testing, I have found that mileage varies. Using the fantastic WebPageTest tool, I performed three test batches, each with nine runs. The table below shows the aggregated results for the median run in each batch (except for the row marked “Mean” which is the mean of all nine). For the first batch, I ran the test using all of the other performance features I have built into my site, including HTTP/2, save for HTTP/2 Server Push. The second batch used HTTP/2 Server Push for all scripts and stylesheets. The last batch added HTTP/2 Server Push additionally to the .woff and .woff2 font files as well as the site logo .png. I was expecting speeds to improve from left to right in that table. Unfortunately, that is not the case. 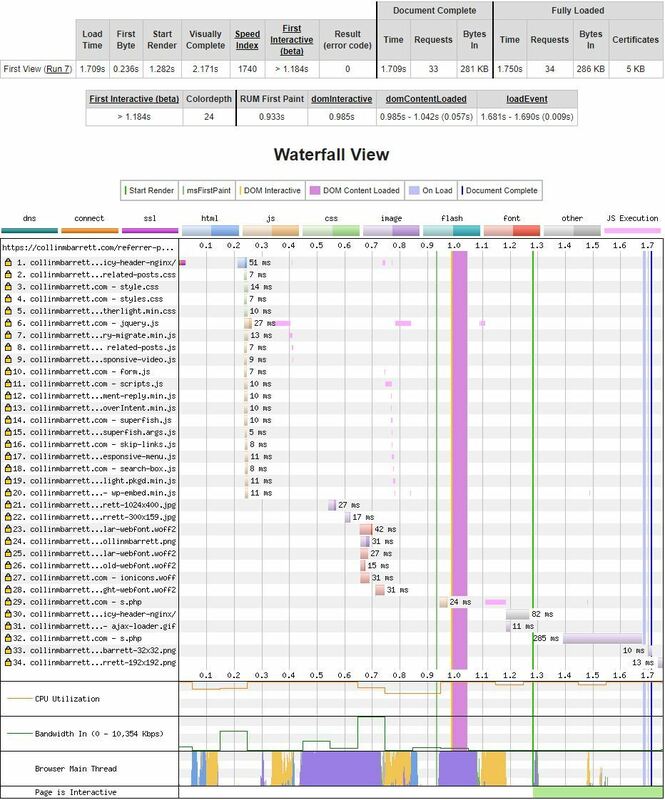 Some argument can be made that batch two (pushing scripts and stylesheets) did outperform in some metrics such as the WebPageTest Speed Index, however not using HTTP/2 Server Push at all appears to be the most performant for this particular page. 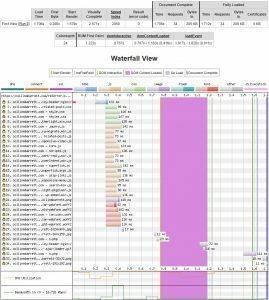 The waterfall charts (click to enlarge) are where you can really see what this feature is doing. 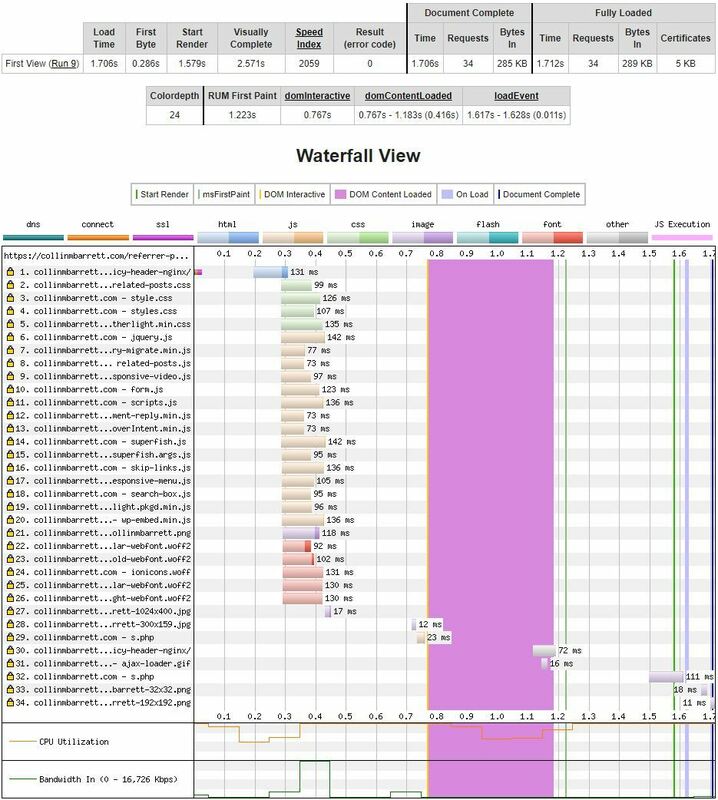 When no assets are pushed, resources are received by the full round-trip request/response lifecycle and not all in parallel. 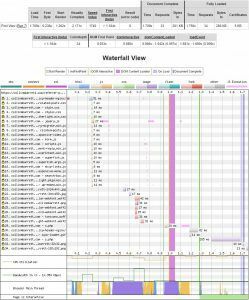 Applying HTTP/2 Server Push to the scripts and stylesheets downloads all of those resources in parallel and they require far less time to acquire. The files are now downloaded from the browser’s perspective on the order of around 10ms on average vs. more like 25ms when not pushed. This disparity would likely be even greater if I were not using a global CDN (Cloudflare) to deliver assets from nodes near the client. The true median run when I applied HTTP/2 Server Push to fonts and the logo .png as well produced a bit of an anomaly waterfall. As you can see below, all of these assets were downloaded immediately and in parallel as we’d expect. However, the download times for the assets were much higher than expected. If we look at all of the other runs in the batch, though, this seems to be due to a fluke of some kind (such as network congestion). 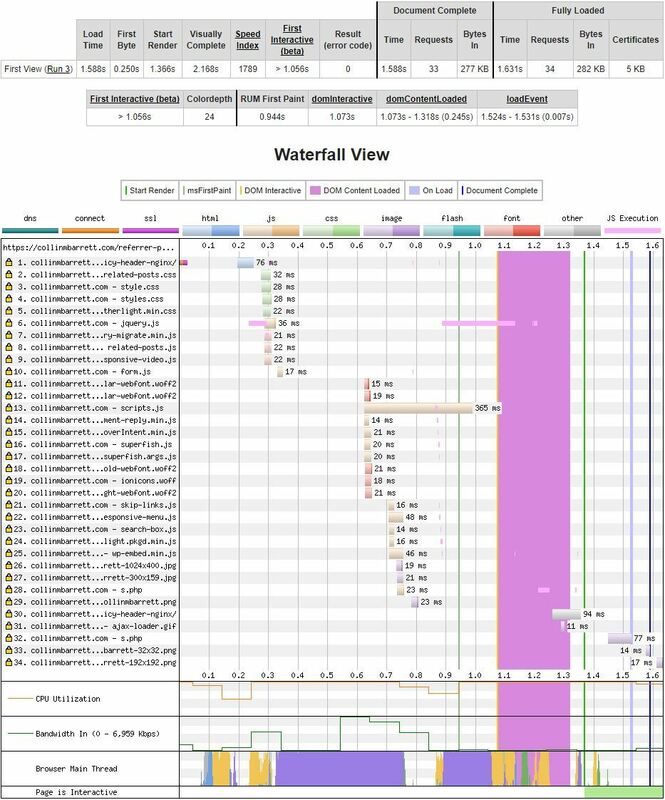 This was a quick unscientific test, to be sure, but it seems to indicate that, at least for this particular page, HTTP/2 Server Push produces a mixed back regarding performance change. I would need to test this on multiple devices and multiple network connections to get a bit better feel as to whether it is a keeper or not. Unfortunately, applying HTTP/2 Server Push to resources is not automatic. For now, you have to hint what resources to push manually. The key prerequisite is that your web server supports HTTP/2. With WordPress, two plugins that I have tested automatically handle this for scripts and stylesheets. HTTP/2 Server Push is a fantastic standalone plugin that does just that. Install and activate it, and it should go into effect immediately. If you are a CloudFlare user, the CloudfLare plugin can do essentially the same thing without needing to install a second plugin. To enable HTTP/2 Server Push with this plugin, just add the line below to wp-config.php. More info here. These plugins can only apply the necessary hints to scripts and stylesheets, however. My understanding is that this is due to the current queueing architecture of WordPress resources. If you are using NGINX as a web server, though, you can add the hints via headers in the server block of your NGINX .conf file. Something like below should do the trick. I have not yet decided my strategy is going forward for this feature. I want to love it, but I love results more. I think it requires case-by-case analysis and tuning. Give it a shot for your sites, and let me know how it works for you.